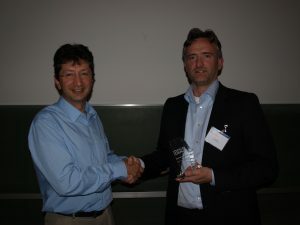 In Hannover Dr. Jan Veldink received the first ENCALS Young Investigators Award for the most promising investigator under 40. The price was presented to him by the chair of the ENCALS Young Investigator Committee; Prof. Ammar Al-Chalabi. Jan Veldink works as a neurologist and researcher at the ALS Centre Netherlands at the University Medical Centre Utrecht in the Netherlands. His research is mainly focused on the genetic causes of ALS with the aim of finding ways to progress the search for a cure of ALS.